Oak Hollow began as a tiny seed of an idea, when developers discovered an undisturbed 368 acres located on Old Jacksonville Highway in the heart of South Tyler. The area is home to majestic oak trees and natural beauty – a natural fit for their vision of an urban village surrounded by lakes, greenbelts and walking trails. 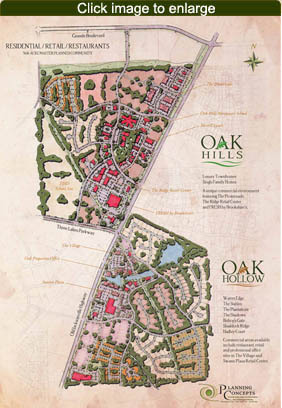 Today, Oak Hills and Oak Hollow is Tyler’s premier mixed-use master planned development, a perfect blending of stateliness and sophisticated living. Much like the oak tree for which it is named, Oak Properties represents quiet elegance, strength of community and prosperous living. Its roots are firmly planted in East Texas, much like the families and businesses that will also take root here, and live among its branches.